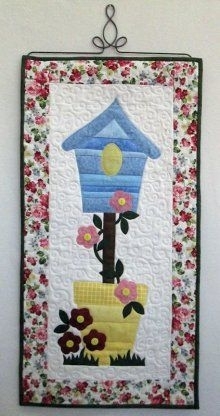 Make this adorable Birdhouse hanging! This Birdhouse is really beautiful. You can create this with your ScanNCut with ease! We will learn how to scan in a pattern and cut it out right onto our fabric. Don't have a ScanNCut? Let us know and you can borrow one of ours! -(1) Background Piece in prefered color cut to 10.5" x 24.5"
-Cotton Scraps in 5 Shades of Blue, Yellow, Brown, Pink Green and Purple all with Applique-Backing. Remember, any class supplies bought from the store for use in this class get 10% off! This class will be held 4 days.